Well-suited for the smaller washroom with less space and traffic, this unit dispenses 350 C-fold or 475 multi-fold paper towels. Includes 2.2 gal. 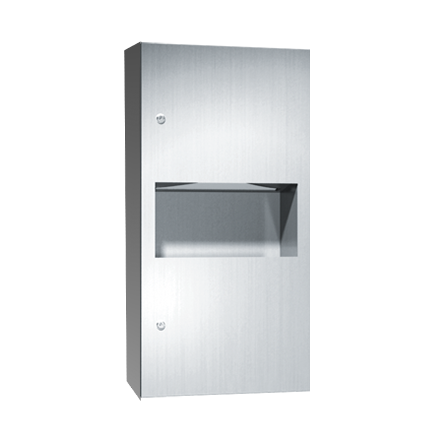 (8.4 L) stainless steel waste receptacle. Door held closed with tumbler lock. All exposed surfaces have No 4 satin finish. Towels are self feeding until supply is depleted. Unit will continue to feed properly when reloaded with a partial load in place. Locked door prevents unauthorized access or removal.